The descriptor D5 related to eutrophication can be considered as a 'mature' descriptor as many actions have been undertaken for the last decades to understand, assess and combat this environmental issue. Although not clearly specified in Directive documents, the use of methodological standards is recommended for comparability of approaches in determining GES and environmental goals within and among marine regions. The on-going intercalibration exercise conducted as part of WFD provides common assessments and methodological standards for the assessment of eutrophication in WFD-MSFD overlapping waters. This process can partially support and consult the application and development of methodological standards for offshore waters, where different approaches may also be required. Table 1. The following table presents methodological standards reported on a pan-European level per criterion and indicator for eutrophication. Colours correspond to the frequency of use of each method across the MS in each region. The first factor promoting eutrophication is nutrient enrichment. The process of enrichment can be natural and human-driven. Management concerns in the frame of MSFD should focus on the extent to which anthropogenic activities at the coast and on land may cause increase in nutrient loads and changes in the nutrient ratios in marine and coastal waters (pressure criteria). The assessment of D5 then combines information on nutrient levels and a suite of primary (direct) and secondary (indirect) effects that are ecologically relevant, taking into account appropriate temporal scales. Ferreira et al. (2011). Overview of eutrophication indicators to assess environmental status within the European marine Strategy Framework Directive, Estuarine, Coastal and Shelf Science, Volume 93, Pages 117-131. HELCOM's thematic assessment of eutrophication 2007-2011 (HELCOM 2014) was adjusted to the MSFD and Commission Decision 477/2010/EU. The assessment of the open sea sub-basins is based on the integration of commonly agreed core indicators, grouped into three criteria: nutrient levels (indicators: inorganic nitrogen and phosphorus concentration), direct effects (indicators: chlorophyll- a and Secchi depth), and indirect effects (indicator: deep bottom oxygen debt). The assessment is done using the HEAT 3.0 assessment tool, which averaged indicators within criteria (allowing weighting), and using the one-out-all-out principle between criteria for determining final eutrophication status. Ecological status resulting from WFD is used where available to describe the state of coastal waters. The HELCOM EUTRO-OPER project (2014-2015) aimed toward a regularly updated high-quality thematic assessment of eutrophication status, produced through an operational and streamlined process. During the project, the entire assessment process, from monitoring and data aggregation to assessment calculation, was defined and documented, together with QA/QC guidance. In the OSPAR region, eutrophication status is assessed by using the OSPAR Common Procedure (COMP, OSPAR 2013) which comprises two steps: a Screening Procedure to identify areas that are obvious non-problem status for eutrophication, and a Comprehensive Procedure applied in those areas not identified as non-problem areas. The initial screening procedure is risk-based and requires consideration of relatively few parameters related to hydrodynamic characteristics and proximity to nutrient sources. If the initial screening or successive Comprehensive procedure assessments show the waters not to be impacted by eutrophication, a more robust assessment of its trophic status is not required. 4) other possible effects (e.g. algal toxins although this is recognised as not strongly linked to eutrophication). Each of these parameters may be considered area-specific or season-specific. The assessment parameters are integrated along a cause/effect scheme including all categories for a classification as 'problem areas', 'potential problem areas', and 'non-problem areas'. The integration is followed by an overall assessment of all relevant information related to harmonised assessment criteria, their corresponding assessment levels and supporting environmental factors to reach the final area classification. The Barcelona Convention: MEDPOL's eutrophication monitoring strategy consists of identifying sites that are eutrophic or sensitive to eutrophication (together with reference sites) and the development of biological parameters/indicators of eutrophication to support the existing monitoring strategy. The list of mandatory monitoring parameters includes nutrients, transparency, chlorophyll, dissolved oxygen and phytoplankton parameters. Other parameters such as macrophytes, organic matter in sediment and zooplankton are recommended. Recently (UNEP/MAP 2012) the Contracting Parties to the Barcelona Convention have adopted the ecosystem approach to the management of human activities that may affect the Mediterranean marine and coastal environment. Its implementation is based on a 6-years management cycle, relying on common strategic goals and the development of Ecological Objectives aligned with MSFD descriptors. Accordingly, Ecological Objective 5 (EO 5) is defined as: "Human induced eutrophication is prevented, especially adverse effects thereof, such as losses in biodiversity, ecosystem degradation, harmful algal blooms, and oxygen deficiency in bottom waters ". EO 5 is associated with 3 operational objectives (nutrients, direct and indirect effects) and 6 indicators similar to MSFD. The Black Sea Convention has developed the Black Sea Integrated Monitoring and Assessment Programme (BSIMAP), within which each country is obliged to carry out ecological monitoring on marine stations, with particular emphasis given to eutrophication. BSIMAP has been developed according to BSAP (Black Sea Strategic Action Plan) and its EcoQO 3: Reduce eutrophication. 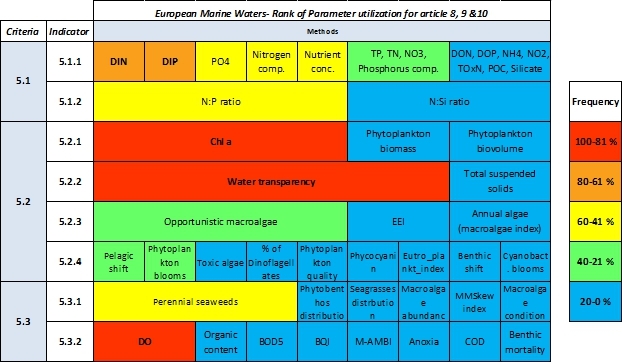 The list of mandatory parameters from BSIMAP includes nutrients, transparency, dissolved oxygen, chlorophyll-a, phytoplankton and macrophytobentos. Note that the Black Sea Convention has recently developed its own assessment tool (BEAST) using similar methodological approach than HELCOM's HEAT 3.0. Coordinated activities such as the EU Baltic2Black EU Baltic2Black project are examples of good practices towards harmonized assessment of the eutrophication status in European seas.